MODEST Tracy hasn’t enjoyed the same chart success of her 1998 self- titled album, when her talk of revolution moved the masses. But Chapman’s tour is a sell-out. The radical edge has softened to produce introspective ballads on current album Let It Rain, focusing on things that happen outwith our control, including her sadness at the war with Iraq. Her voice is crystal-clear and laden with emotion. The lyrics are passionate, plaintive and delivered with real sincerity. You can’t help but warm to her. She even admits to her Scots audience that she has tried haggis, albeit the vegetarian variety, and seems ashamed about not liking it that much. From the new album came the seductive In The Dark, gospel-driven Say Hallelujah and bluesy You’re The One. This contrasted with a trip through her back catalogue from Across The Lines to Behind The Wall. Favourites Fast Car and Talkin’ Bout A Revolution still sounded fresh. She’s Got Her Ticket showcased excellent guitar work from Joe Gore. Telling Stories showed that she can rock with a heavier vibe. A standout track was the beautiful The Promise, merged with Save A Place For Me. Encores produced the Bob Marley classic, Get Up, Stand Up – dedicated to world peace – which got the crowd on their feet, and she left us with the gentle lament, I Am Yours, from the current album, ending poignantly with the words “… I am yours/If you are mine”. Given that Tracy Chapman’s career-defining moment occurred nearly 15 years ago at Nelson Mandela’s 70th birthday concert at Wembley in 1988, the average age at this sold-out gig is surprisingly low. The Boyzone factor (their cover of Chapman’s Baby Can I Hold You was a hit in 1997) clearly remains a draw. But for one so renowned as a protest artist, Chapman proves an unexpectedly shy and halting speaker . And her recent album, Let It Rain, dwells largely on personal, rather than political themes, meanwhile tapping deeply into African-America’s musical heritage. The uplift and anguish of gospel, soul and blues suffuse much of the new material, like the squally, imploring Another Sun, the brooding In The Dark and the loose-limbed swagger of Say Hallelujah. Chapman’s glorious vocal blend of gravel and velvet carries commandingly through a somewhat abrasive sound mix, with her set also ticking off the requisite classics — a slightly ponderous Talkin’ ‘Bout A Revolution, the a cappella Behind The Wall, and a heart-rending Fast Car, her original breakthrough hit. Two more stand outs are lifted from 1995’s New Beginning LP — the tender love-song The Promise, and the blistering blues workout of Give Me One Reason. Chapman’s obvious enjoyment of the latter suggests that maybe she should let rip more often. THE raw emotion of her formative years in the business may have given way to a more thoughtful approach but Tracy Chapman demonstrated last night that she retains plenty of musical bite. The Cleveland-born singer-songwriter could do no wrong in front of an appreciative crowd at the Clyde Auditorium. Her 100-minute set was dominated by tracks from her current sixth studio album, Let It Rain and interspersed with the classics of old. Recent single Another Sun and You’re The One were especially well delivered. She is maybe not the overt firebrand protest singer who shot to fame in the late 80s, but Tracy Chapman’s voice remains as resonant and relevant as ever. Tracy Chapman is a songwriting institution – it’s as simple as that. One of the most socially relevant singer/songwriters of our time, she has become a unique voice of our generation with her unmistakable passionate vibrato. Since bursting on the scene in 1988, she has become a real icon in the folk/rock world. Her stark, leftist songs, with no happy endings, may not have been the normal recipe for pop-idol status, but she bucked the trend and won that rare combination of huge success and great respect. 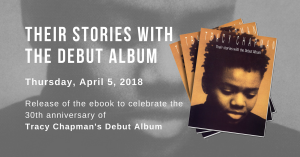 Whether it was the startling sincerity of her multi-platinum-selling Tracy Chapman debut, which featured the now classic Fast Car, or the subsequent Crossroads and Matters of the Heart, which featured the hit Bang Bang Bang, she has always shared with her audience stories that matter and songs we can relate to. Her huge success is a far cry from the coffee houses and nightclubs of Cleveland, Ohio, where she first showcased her work, but there was never any doubt that ‘the voice’ would one day be recognised. Not only has Chapman got four Grammys under her belt and a heap of other awards to boot, but she has also participated in some of rock’s most legendary live events, including Amnesty International’s Human Rights Tour, London’s Freedomfest honouring Nelson Mandela and the Bob Dylan 30th Anniversary concert. Let it Rain, her sixth studio album, marks a further achievement in her 15-year career. Co-produced with John Parish (PJ Harvey, Sparklehorse, Eels), Chapman also managed to find a core group of musicians to track the 12 songs, all of which were recorded in a studio overlooking San Francisco Bay. Whether it was the magical scenery, the accompaniments or just plain Chapman magic, the result is a beautiful album, in which none of her purity or intense spirit has been lost over the years. The songs too are as evocative as ever. The catchy melodies and clarity of the lyrics are what have always distinguished her. Let’s face it, it’s not every day that you get to see Tracy Chapman play live in Scotland, and if you’ve nothing better to do on a cold Monday in March, why miss out on the rare opportunity to see a legend? TRACY CHAPMAN has an estimable reputation; as an idealist, a performer who shuns the grandiose and complicated in favour of the most honest, barest bones of musicality. The melody, the lyrics are the rocks upon which Chapman’s temple is built. Live, her vocal power is enormous, yet rich and velvety. Every nuance of every lyric is valued as Chapman spins her tales of domestic violence, small-town life and the yearning for escape. She’s incredibly modest and the adulation of the crowd seems to embarrass her. Tracks from current album, Let It Rain, prove that her songwriting gift remains intact, while the songs she released as a teenager, such as Fast Car, have lost none of their yearning intensity. In the current climate, it was only fitting that Chapman should encore by covering Bob Marley’s rallying cry to the people, Get Up, Stand Up. It was, simply, a wonderful performance. Clara H., 03/19/03: What a fantastic night! Tracy was on great form and interacted well with a very vocal Glaswegian audience! Lots of smiles from her and she seemed really relaxed. A handful of us braved the cold for over an hour and managed to meet her afterwards before she left for the overnight ferry to Ireland. Got my poster signed and have it framed on my bedroom wall already!! Haste ye back Tracy! !